Being a critical component of emergency medical services, ambulances are largely responsible for whether a patient is able to receive appropriate medical assistance at the earliest. However, EMS services provided by ALS and BLS ambulances are not always enough, and patients often need to be transported to the nearest hospital at the earliest, to receive appropriate medical care. As such, there are a number of critical features which ambulances absolutely must have, in order to make the patient’s ride comfortable, improving his chances of survival. While ambulance services in India have improved manifolds over the last few decades, there is still room for improvement, especially in a number of Tier-2 and Tier-3 cities. Additionally, with an estimated 130,000 deaths being a direct result of road accidents every year, the need for well-equipped ambulances is a major concern of today. 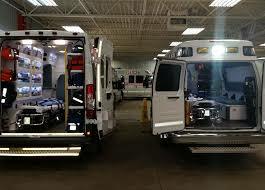 In order to improve the quality of the patient’s ride and maximise his or her odds of survival, the government and private sector must come together to ensure that all ambulances, including Medical First Responder and Patient Transport Vehicles, are outfitted with a few specific features. A minimum of 2 stretchers are a must in every ambulance to facilitate a quick and comfortable transfer of the patient from the emergency site to the ambulance, and upon reaching the hospital, to the emergency room. Splints and medical braces should be present on ambulances to help stabilise the injured person, in case of fractures and dislocations, until he can receive appropriate medical attention. These help support and immobilise broken bones to prevent further damage and pain in the affected area. Every ambulance should be equipped with first-aid kits containing essentials like bandages, sterile gauze dressings, plasters, crepe bandages, adhesive dressings, disposable gloves, scissors and tweezers, and disinfectant sterile solutions. They must also have at least two manual and battery-operated suction devices which help remove fluids and obstructions which might be blocking the patient’s airway. Hand-held bag mask ventilation units are also essential in providing positive pressure ventilation to patients who are unable to breathe or are facing difficulty in breathing. Non-metallic Oropharyngeal Airways are critical medical devices required in ambulances when dealing with an unconscious patient. It works by preventing the muscles in the jaws from relaxing, and the tongue from obstructing the airway. A must have in all ambulances, oxygen cylinders are often responsible for helping save a patient’s life by providing him with clean oxygen artificially. With the spinal cord being one of the most critical parts of the human body, Spinal Immobilisation Devices are crucial in stabilising patients with a severe spinal injury, to avert future complications like paralysis and the like. Blankets designed to keep the patient warm and comfortable, while preventing his body temperature from dropping, are essential to stabilise them on the journey. Protective head gear is another must have device in an ambulance to safeguard the patient against further injury while on transit. A standard rescue hammer with a 2kg head and a 15 inch handle, to break open glass and other materials when rescuing a patient from an inaccessible location. An emergency axe to cut down obstructions preventing the EMS personnel from reaching the patient. A wrecking bar, at least 24-Inch long, to be used as a forcible entry tool in the case of overturned vehicles or where entry is obstructed by debris. A crowbar, at least 48 inches in length, with a pinch point, to pry open doors and other obstructions which might be jammed. A fully functional and filled extinguisher is a must in an ambulance, in case of an accident, along with proper electrical safety measures to prevent short circuits from occurring. In order to minimise loss of life and injury during accidents and calamities, it is necessary to ensure that patients have access to only the best quality of healthcare and emergency services. It’s for this reason itself that ZHL is committed to equipping its ambulances with the most advanced medical equipment available, because if something helps save or improve a person’s life, it’s well worth the investment.